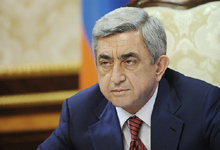 President Serzh Sargsyan sent a letter of condolences to the President of Greece Prokopis Pavlopoulos President Serzh Sargsyan sent today a letter of condolences to the President of the Republic of Greece Prokopis Pavlopoulos on the demise of the former President of Greece Konstantinos Stephanopoulos. On the occasion of the irreparable loss, the President of Armenia expressed deep condolences and support to the family of Konstantinos Stephanopoulos, his friends, and the friendly people of Greece. President Serzh Sargsyan sent a letter of condolences to the President of India Pranab Kumar Mukherjee President Serzh Sargsyan sent a letter of condolences to the President of the Republic of India Pranab Kumar Mukherjee on the train accident which took place in Uttar Pradesh state of India and claimed hundreds of human lives. President Serzh Sargsyan sent condolences to the Emir of the State of Qatar Sheikh Tamim bin Hamad Al Thani President Serzh Sargsyan sent a letter of condolences to the Emir of the State of Qatar Sheikh Tamim bin Hamad Al Thani on the demise of the former Emir Khalifa bin Hamad al-Thani and expressed deep condolences to the Emir and the friendly people of Qatar.